What can we smell? In order to smell something, it must have two properties. The first is that it must be in the air so that it can get into your nose. Most things you smell have liquid particles that can be carried into the air, and this is why many smelly products are liquids (e.g. perfumes, air fresheners, etc.) The second requirement for something to be smelled is that the tiny particles now in your nose must fit the receptors (little detectors that are specific for different molecules in the air). This works because most smells are really made up of primary odors that your nose can split up and identify. All of the possible smells happen by mixing these smells in different combinations and amounts. Scientists were able to determine the 4 major taste components and map them directly to areas on the tongue, but efforts to do the same with smells have proved more difficult! For this reason, categorizing smells may require you to use more than the primary odors (especially since most of these smell BAD!) Shown below is a list of possible smell descriptors. If you do not know exactly which category something fits in, make up your own! stickers work in a similar way (see Scratch-and-Sniff Stickers activity). your samples. This will help you to set up a good experiment! adhesives make the best scented insert! A. 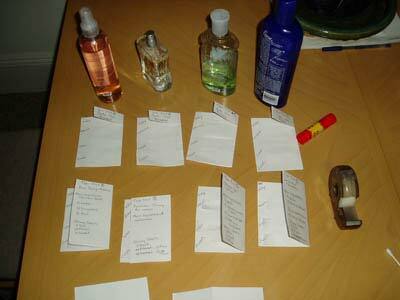 Cutting and Labeling Your Scent Samplers. each over, leaving ~2cm hanging out on the bottom. Divide folded pieces into pairs. four), as tomorrow, 3 days, 5 days and 1 week. (see Figure 1, next page). weakest one you can smell - try to get at least three per scent! 7. Repeat for your other sample. Now, make your scented samplers (one glue and one tape sample per scent). upwards to the other strips. make sure that the area is small enough to be covered by the tape. 4. Again we must cover the scented lines, but this time with tape instead of glued paper. the scent on one of the four sections. Repeat until all four sections are covered. 5. Save samples for use in the Comparing Scented Inserts activity.